China's 'Shadow Banking' And How It Threatens The Economy : Parallels China's economic growth has been fueled by bank loans that flow freely. But during the latest bout of turmoil, China's central bank indicated that it may no longer lend so quickly and cheaply. The so-called shadow banking sector is of particular concern. 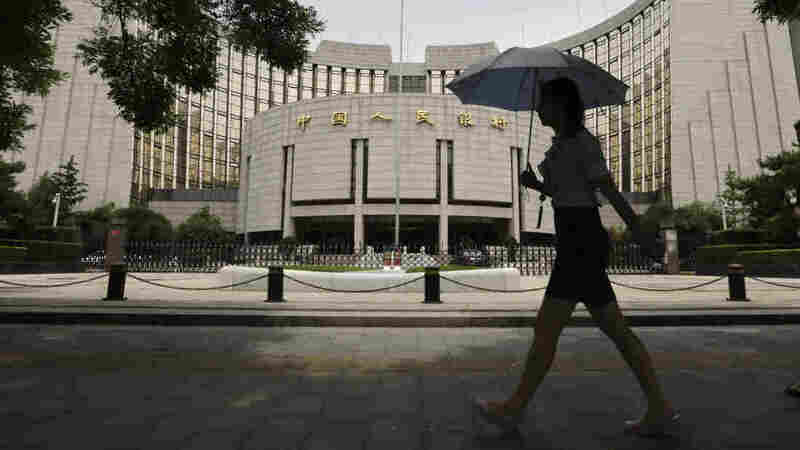 A woman walks past the headquarters of the People's Bank of China (PBOC), the central bank, in Beijing. Last week was a wild one for China's economy. Interest rates on the loans that banks make to one another soared to alarming levels, and lending began to freeze up. Shanghai stocks nose-dived, taking Asian markets and the Dow, briefly, with them. Things have calmed down, but the crisis showed how China's new leaders are trying to confront threats to the health of the world's second-largest economy. Many here see it as the first shot in a long battle to reform a once-successful economic model that is now running out of gas. In this particular case, the People's Bank of China — the nation's central bank — wants to cut down on rampant and risky lending. So earlier this month, in a departure from the past, it refused to pump money into the system when some banks desperately needed it. "The central bank wants to send a message," says Oliver Rui, a finance professor at the China Europe International Business School in Shanghai. "Don't take it for granted that whenever you need the money, you can easily get it." Rui says the government was targeting midsized, state-run banks that lend into what's known as China's "shadow banking" sector. Here is an example of how shadow banking can work and why it concerns the government: A state-owned company borrows from a state-owned bank at a government-set low interest rate, maybe 5 percent. The company then re-lends the money at a much higher rate of return, say 10 or 12 percent, to a private trust company that is part of the shadow banking sector. That trust company then lends the money into a more speculative part of the economy, such as real estate. The volume of lending in China's shadow banking sector has grown dramatically in recent years. While trust companies are regulated, officials worry about pouring so much money into the housing market, where prices are high and many apartments sit empty. "If people realize there is a huge bubble in the real estate sector, that could create huge problems," says Rui. "Even if the project is good, if everyone calls in the loans, then no one can return the money." Rui says the government fears cascading loan defaults and bankruptcies, not unlike America's subprime mortgage meltdown. Analysts say putting pressure on shadow banking is just the first step in a long process to build a new, more sustainable and efficient economic model. China's new leaders face opposition from many vested interests who have benefited under the old system, including those state-run banks. But with the country's economic growth continuing to slow, Rui says Chinese President Xi Jinping and Premier Li Keqiang seem ready to push change. "Don't underestimate the determination of the new government," Rui says. "They are very serious, because it's a threat to the safety of their power and also the country."